Hey folks! It has been WAY too long since I've written a formal blog post, but we have been very busy with "life" stuff. Brittany started a new job, we've become much more involved at our church, and you know we still have that whole wedding thing we need to plan... Anyway, we're back and I have so much to talk about! We've been excited ever since Pixar Fest was announced to be coming to Disneyland earlier in the year and now that we've gone twice, I want you to know, it's even better than we dreamed it would be! I'd love to do a whole write up about Pixar Fest in a later post, but right now I just want to share our outfits with you that we wore to the Fest this last visit. Britt had been talking about making a Kevin inspired dress for a long time and she even made me a Wilderness Explorer hat to go along with her outfit. But needless to say, I went a little bit overboard and ended up making a full on Russell cosplay when all was said and done! My favorite thing about putting this costume together was that it's really more of a crafting project than sewing. Aside from the sash, which Britt so awesomely put together for me, the whole costume just took time and a few trips to the craft store. It seems like a lot, but really that bottom half of the list just took a trip to the mall to buy some clothes. As far as clothing was concerned the hardest part was threading the shoe laces for me. I could not find orange shoe laces anywhere in town and I was on a deadline and couldn't order them online, so I bought orange paracord from the crafts store. I thought it would work great, it ended up looking perfect, but it was just slightly thicker than shoe laces and without the nice rigid ends of the laces it was a royal pain stitching it through both pairs. But you can't argue with those results! Now with the hat, Britt had purchased a patch off of Etsy and ironed it on to a craft store hat. It looked perfect, but how could I replicate that quickly and without having to buy 50 more patches? Remember Russell only has 47 of his 48 skills badges, since he's working on his "Assisting The Elderly Badge" but then you still need two more for the flag... and one for the progress beads... and one for his polo... and where the heck was I going to get a neckerchief slide? My manageable list seemed like a daunting task once more, but it turns out my answer to all of those things would be just one thing. With just a small amount of Googling, I found these two articles (here and here) of how to put together some merit badges. Both guides involved printing out the badge designs, sticking the paper to craft foam in some fashion, and then adding some durability with some good old fashioned Mod Podge. While one of the guides used regular paper and glued it to the foam and the other used the more expensive foam sheets that have their own adhesive, I mixed it up and used sticker printer paper so the designs were adhesive on their own. I tried cutting them out in two different ways. First I cut the stickers out, stuck them on the foam sheet, and then cut the circles out again. Then in order to save a step, I tried just sticking the whole sticker sheet on to the foam and cutting out the circles once. This second way made the sticker paper curl up at the edges unattractively, so I recommend taking your time and doing the double cut system. I chose to give everything two coats of Mod Podge for just a bit more rigidity and durability. If you've not used Mod Podge before, make sure you use a foam brush for a job like this and wait at least 5 minutes between each coating. The merit badges were all done and Britt put together my sash using this sewing pattern/tutorial (this guide is for a small child, but upon doing some research on the Boy Scouts website we found that an adult sash is approximately 64" long and we just modified the pattern from there.) and I just hot glued the badges to the sash. I still needed to make all the other Wilderness Explorer paraphernalia, but as I mentioned earlier, this foam/Mod Podge strategy would end up working great for everything else! 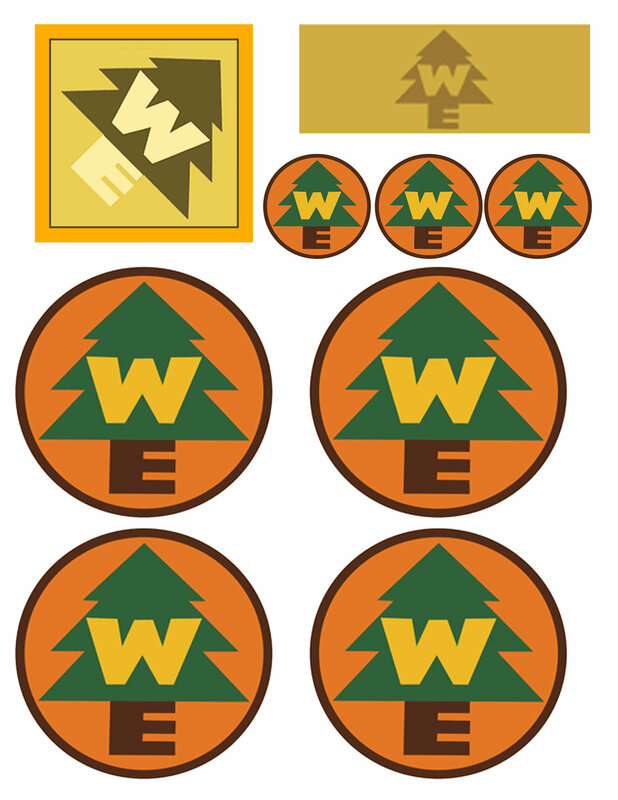 The badge designs I found online were perfect (check them out here), but I wasn't really satisfied with the other Wilderness Explorer design files I found so I just made my own. I formatted it all onto one sticker sheet and threw some extra logos in there as well. I didn't recreate Russell's backpack for this trip, but you could easily get some cheap camping gear and throw the extra stickers on for more authenticity. Or if you're like me and just love stickers, they look awesome on anything! The flag requires two of the large logo badges, a sheet of felt, and a wood dowel. Throw in some hot glue and scissors and you're all set. The neckerchief and slide were even easier. Orange fabric cut to approx. 32"x45" (once again the sizing came right from the Boy Scouts) and a bit of foam rolled into a tube. I added a bit of extra foam behind the logo for durability being worn around a theme park all day. For the pin on Russell's shirt I didn't even need foam, I had an extra 1" button from the California Adventure Food and Wine Festival, so I just stuck a sticker on it and Mod Podged it to get a nice glossiness. Creating the Progress Beads was only tricky because, it took me three trips to the store to find beads that I thought looked right, but that was just me being picky! Throw in some cord, hot glue, and safety pins and you're all set to be a Senior Wilderness Explorer. Putting this costume together, was a ton of fun, and running around Disneyland as Russell was even better! Like I said, this costume was not really difficult and the supplies are all very common, it's just a matter of patiently cutting out and sealing all of the pieces. Just gather your supplies, grab some scissors and throw on your favorite Disney playlist! Brittany and I are already working on our next outfits for Pixar Fest and I can't wait for you to see them. It's going to be some of the most elaborate crafting we've ever done, so I'm both nervous and excited. Pixar Fest will be running until September, so expect a whole bunch of themes from us over the coming months and make sure you follow us on Instagram to follow our most up to date adventures. Until then, "The wilderness must be explored! Caw caw, ROAR!"